Last Wednesday we were very surprised to hear that FairMail was awarded with the Best Partner Award at Nyenrode Business University. This competition aims to highlight successful examples of partnerships between companies, government and non-governmental organisations (NGO’s) that contribute to international development. According to the Dutch government the business community has a vital role to play in the future of international development cooperation. And according to the jury FairMail is a prime example of this new way of thinking and acting. Both because of the partnerships with local NGO’s in Peru, India and Morocco that work with at risk teenagers and because of the partnerships with international card publishers printing and selling the cards in Europe. 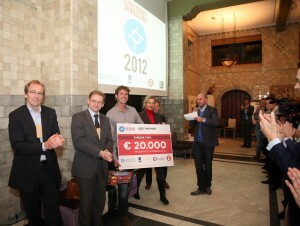 The competition was organized by the Dutch Ministry of foreign affairs, NCDO, NU.nl and Behold. Winning the award means, besides the recognition and media attention, 20.000 euro in marketing budget to be spent on NUzakelijk.nl.